• Will be the first MT bike to be manufactured by Yamaha in India. • India launch likely by mid-2019. • Is expected to be priced Rs 10,000 to Rs 15,000 cheaper than the Yamaha R15. 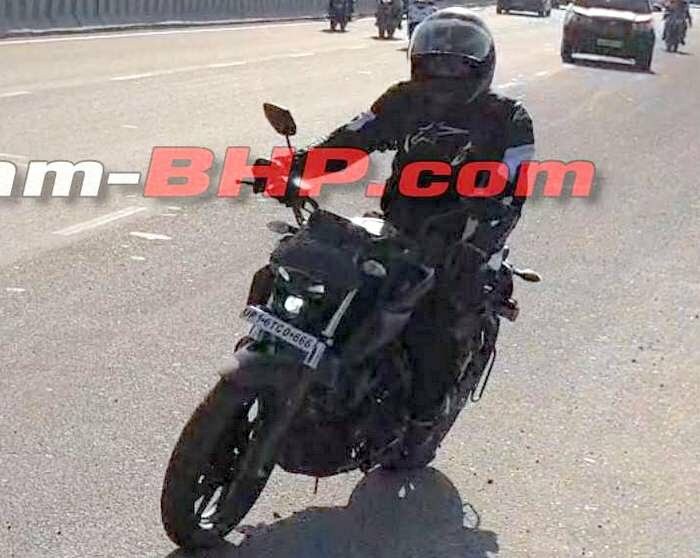 While all eyes are on the Yamaha FZ Version 3.0, which will be launched today in India, the Yamaha MT-15 has been spotted testing again. The Yamaha MT-15 was first caught testing on Indian soil last week, running on Uttar Pradesh license plates. While we got a profile and rear shot of the MT-15 that time, the latest image of the test mule is head-on and we can clearly see that the India-spec MT-15 will feature the same predator-styled LED headlight as the international-spec model. There were concerns whether Yamaha India would heavily localise the MT-15 for our market, as in the previous spy images one could see that the bike testing in India was running on conventional telescopic forks and a box-type swingarm as opposed to the cast aluminium unit seen on the Thailand-spec model. Another visual distinction are the redesigned alloy wheels, which have been sourced from the Yamaha R15 version 3.0. The MT-15, in essence, is the streetbike version of the R15 and it will be the first Yamaha MT bike to be built in India. Providing firepower is the same liquid-cooled motor as the new R15. The 155cc, single-cylinder, SOHC engine delivers 19.3hp and 15Nm of peak torque. It also features Variable Valve Actuation (VVA), which helps the motor deliver good low- and mid-range performance without compromising on top-end delivery. Transmission duties are handled by a 6-speed gearbox. Cycle parts on the India-spec MT-15 is expected to be similar to the R15 Version 3.0, but the steering geometry could be different to suit its street bike dynamics. Stopping power is offered by disc brakes on both ends, while the MT-15 is likely to get a dual-channel ABS as seen on the new R15. In terms of pricing, the Yamaha MT-15 is likely to be Rs 10,000 to Rs 15,000 cheaper than the R15 ABS, which has been priced at Rs 1.39 lakh (ex-showroom, Delhi). Once launched, the MT-15 will compete against the KTM 125 Duke.